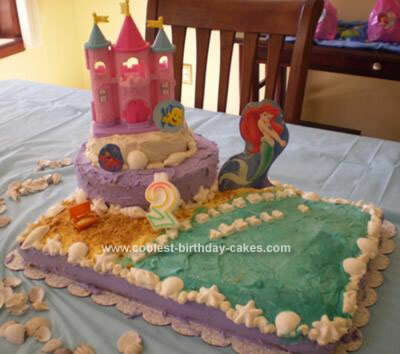 This Beach Scene Birthday Cake is a three layer yellow cake with buttercream icicng. I made white chocolate shells from molds and lined the cake. I used a plastic castle for decoration (we already had). The Ariel characters are from a sticker book, the cardboard part. I cut them out and glued toothpicks on back and stuck them in the cake. I used crushed graham crackers for the sand.